Our Roadsmart all-round street performer shook up the pecking order for high performance road tyres when it was launched in 2008. No longer do you need to accept a compromise between mileage or grip, comfort or feedback, stability or maneuverability. The Roadsmart offers it all at the very highest level in one tyre! Our acclaimed Multi-Tread (MT) technology enables the use of two different compounds. 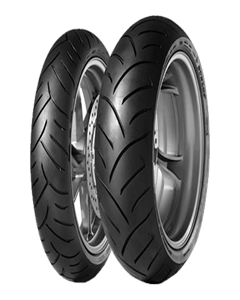 A harder, tougher rubber in the centre will give excellent durability desired by mile crunchers, while a softer and more 'grippy' compound will satisfy even 1000cc supersport riders when cornering at extreme lean angles. A unique tread pattern design with higher sea/land groove distribution and deeper tread grooves in the central area maximise performance in the wet, making the Roadsmart the perfect tyre for any kind of road bike in any given conditions.